Stagecast software allows the construction of simple grid based apps using logical 'visual programming' rules. Many sims on this site explore cellular automata and self ordering systems, where short, simple rules create complex, emerging behaviour. Most sims use a default stage size of 18x12 tiles. All tiles are 32x32 pixels. To keep file sizes small, few sims use background images or sounds. Most sims are random animations. They have no controls, simply observe as they develop and self organise. Others are simple puzzles or games. 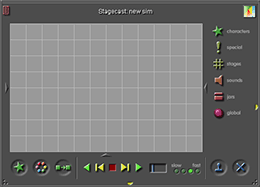 Suitable tilesets and icons for Stagecast sims. They are all in .GIF file format, so you can import them directly into Stagecast. Some test tutorial sims, with downloadable files and a useful 'text function calculator' sim. are trademarks of Stagecast Software, Inc.